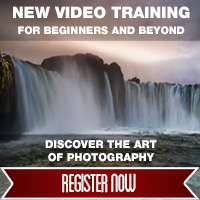 As someone seriously pursuing professional photography, photography workshops are a bit different. If I had the money and was an amateur photographer, I imagine I’d be going on a ton of them. As a pro, I believe in continuing education heavily, but the selection process gets much more stringent. The first selection criteria, is the workshop teaching something I really need or want to learn and I think I’d do much better with some hands-on learning than an online course or something. Also, the ability to arrange the hands-on training without paying someone else comes into play. The second criteria; does the workshop have arrangements, such as special access to subjects or travel plans that it’s certainly worth it to pay someone else to arrange rather than set it up yourself. An idea that is similar to hiring a producer for a commercial shoot. From these criteria, I certainly haven’t participated in many workshops, but when I have, they have been fantastic experiences. The most fun thus far, has been my trip to Midway Atoll National Wildlife Refuge. This trip was light on the instruction, assumption was that participants pretty much knew what we were doing. There was an instructor available for any help needed, but it was a freestyle setting. At the time, when I was a part time photographer and full time food quality lab technician, my focus was wildlife photography. I’ve always loved history though and thus, the combination of the great seabird photography with the history on the island was very exciting. The days were full of excitement, yet very relaxing. We’d get up before dawn and walk over to the Clipper House, a nice French bistro themed around the Pan Am Clippers that made Midway the second stop on their flights across the Pacific. The food was fantastic and the service friendly and humbling as I don’t know that I’ve ever seen anyone work as hard as the two ladies that worked the dining area. Then it was off to shooting. The wildlife was so easy to find and approach that we were able to fulfill any plans we made within an hour or so, thus we came up with a lot of different ideas to try in a week’s time. Then lunch would roll around, so it was off to what used to be the old Navy mess hall. Here the food was a choice of typical American, such as Hamburgers, or authentic Sri Lankan cuisine. I tried a lot of different fabulous curries. After lunch, most of us took a nap through the harsh light of midday. Then we finished the day off with some more shooting and dinner at the Clipper House immediately after sunset. All of this shooting and eating fun was topped off with great times with a bunch of people with similar interests, but diverse backgrounds. We had a WWII Navy fighter pilot, a woman who watched the attack on Pearl Harbor from her yard, and a Swedish woman who was not at all interested in photography but was there as she wanted to bird Midway but thought photographers would be better company since she wasn’t a lister. We even ran into the Secretary of the Navy who was on a tour of ex-Navy bases in the Pacific. It was fascinating to listen to one of his bodyguards, a fighter pilot during Desert Storm, swap war stories with the WWII fighter pilot in our party. Now, my big plan for this summer is a different sort of workshop; Madras A2A X. This is a workshop to teach us some of the skills of air to air photography and provide a general experience built for photographers at a local airshow. It is heavier on the education than my earlier Midway trip; fortunately since I need to learn some things about planning shoots like this and related safety issues. Since I’ve become a full-time photographer my focus has shifted more to vehicles and people and photographing them together, so this is well targeted. My favorite vehicles are definitely vintage aircraft. The second slide show here is from the Airshow of the Cascades from 2013, the workshop will be built around the 2014 show. If you’re interested in this sort of thing I suggest you strongly consider this workshop. If you’d like to see some images from our instructors and organizers, the Facebook fan page for the workshop is a great place for that, https://www.facebook.com/madrasa2ax. Airshow of the Cascades Video from Rick Brown on Vimeo. On August 23 and 24, 2013 I attended the Airshow of the Cascades in Madras, Oregon. To give you some idea of how much fun this was, let me start by telling you the only negatives to the experience. We’re sitting out in the sun a lot, so obviously one needs to wear sunscreen. We figured that it wouldn’t last all day, so my dad started to reapply and the spray bottle broke. We were unable to get anymore sunscreen out of the bottle, so the part of my face the sun hit from about 2:30 until the end of the show got a bit burnt. The other negative was when I was sitting my camera down on its lens hood to rest, some tiny little wasp decided the hand grip to my camera was a good spot to rest. Thus, when I went to pick it up to take a shot I got stung on my ring finger. Fortunately, the poison of this type of wasp is either less effective or there was less compared to a honey bee and the pain subsided in about ten minutes. We left our house in Keizer, OR around 10:00am on Friday and drove up I5 to 212 and then got 26 to go the rest of the way. This made for a pretty good start to our day, 26 is a picturesque drive going through Government Camp and offering fantastic views of Mt. Hood. This also coincided with the Hood to Coast relay race, so we were able to witness some of this big event on our way. We arrived in Madras around 1:30, giving us some time to relax in front of the TV in our hotel room before grabbing a bit to eat and being at the airport at 4:00pm when the gates opened. I hadn’t been to an airshow in a long time and had never been to one held around the sunset hours. It was really cool to see the performances in the nice light of sunset. It did get a bit dark for aviation photography, but with a little of Lightroom’s noise reduction, it all turned out alright. The show concluded with some fireworks. I’m not a big fan of fireworks, but had always wanted to photograph them. This opportunity led me to discover that what I wanted to do with fireworks was surprisingly easy. I made a shot about ½ hour before the fireworks started to capture some color in the scene to serve as my background. Then when the fireworks started I used bulb mode to capture several bursts. In post, I processed both images separately for good color in Lightroom and then loaded them into Photoshop as layers in one image. I put the fireworks burst shot on top and changed the blend mode of the layer to lighten, this dropped everything out but the fireworks themselves. I had moved the camera a bit in between so I applied free transform to the fireworks layer to tweak it to where it lined up to where it should be. Then I merged the layers down and applied a Color Efex Pro4 Glamour Glow. The result of all this has been a group of photographs that I stare at more than I’ve stared at my photos in quite awhile. 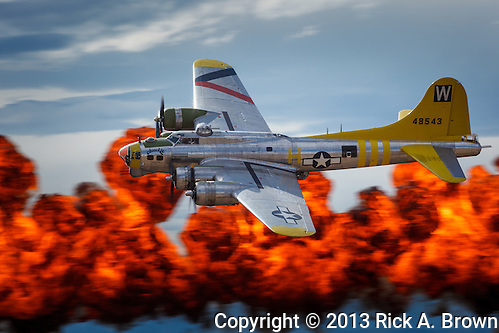 Take a look at my aviation portfolio or my images from the Airshow of the Cascades. This image of the Collings Foundation B-17 has been one of the most popular in my catalog since I posted a link to it on Facebook and Google+ last week. My initial post contained a brief synopsis of how I did the post processing; some of my followers said this method sounded too difficult, so I thought I’d write this post here with some along the way images to illustrate. I used this image of Tillamook Air Museum’s P-51D Mustang. Admittedly, the effect doesn’t look as great with this Mustang image as it does with the B-17, but it still works great for educational purposes. (Small disclaimer, Copyright notices on in-process images should be on the image, not the interface portion. My portal service places the notice automatically and I can’t control its location on a per image basis.) This is the beginning image with just some basic tweaks in Lightroom 4. To start I right click on the image go to the Edit In option and choose Adobe Photoshop. Once there, I open Silver Efex Pro2. I apply the High Structure, Harsh preset and then tweak the settings to taste. My primary goals in this tweaking are to create interesting structure in the aircraft and adjust for the fact that shadows tend to block up in the successive steps. One tweak that I almost always do and I did in this image is to apply the yellow color filter, this tends to separate the aircraft from the sky. At this point, you will probably notice that some areas need lightening and perhaps some need to be darkened. To do this, stamp the visible layers into a single layer at top; this is the infinitely useful [shift] [ctrl] [alt] [E] shortcut. Personally, I use this so often that I have programmed one of my keys on my Wacom tablet to do it. Change the blend mode on this layer to screen, you’ll see the whole image get much lighter. Create a black mask by holding down the alt key while clicking on the create new mask button. Then paint in the areas with white on the mask that need lightening. Finally, adjust the opacity of the layer to blend in this effect. If anything needs darkening, repeat the process with a layer set to multiply blending mode. The image below shows me painting in the mask, for some reason the brush didn’t capture in the screen capture. For the next step, stamp the visible layers to the top again. Then open Color Efex Pro4, here we are going to do the method that I detailed in an earlier blog post. Essentially, this is a recipe I created applying Tonal Contrast and Detail Extractor to the image. After applying the recipe, I click on the Brush button. This opens Nik’s masking app. I paint this effect onto the plane, then adjust the opacity of the layer to taste, I set it to approximately 75% in this case. Now it’s time for the finishing touches. First off I stamp the visible layers on top again. Then I open Color Efex Pro4 again and apply the Darken/Lighten Center filter. I put the center on top of the plane and adjust the shape and size of the center to taste. Finally, I clean up dust spots and do any other tweaks that look desirable. In this case it was just the dust. I would never claim to be able to come up with all of this on my own. Many techniques in this method I learned from NAPP, with some of my own innovations added in. My Google+ friend Monico Havier encouraged me to try this method with the B-17 and now that it worked so well there, I am really watching closely for other places that I might be able to apply it effectively; very anxious to apply it to some air to air images. Please take a look at my aviation portfolio, or my full Collings Foundation gallery. Remember most of these images are available to be prints to hang on your wall. For the method, what you will do is set your camera for an auto exposure bracketing sequence; I chose the base exposure, -2EV and +2EV. Then brace yourself as well as possible and fire off several sequences; the idea here is that you will go back to your computer and try each of the sequences until you find one that works. With several to choose from and the software’s ability to align the images, I’m pretty certain you’ll find one. For the post, I personally use Nik Software’s HDR Efex Pro 4. Have the auto align feature turned on and try the various sequences. Here I went with settings to give the hyperreal look. Finally, the single frame processed with Dark Contrasts and Bleach Bypass in Nik Software’s Color Efex Pro 4.